Hummus, a delicious blend of chickpeas and sesame seeds. Enjoy it as a dip, a spread, or spoon it up directly if you so wish. There is no right or wrong way to enjoy this classic condiment. 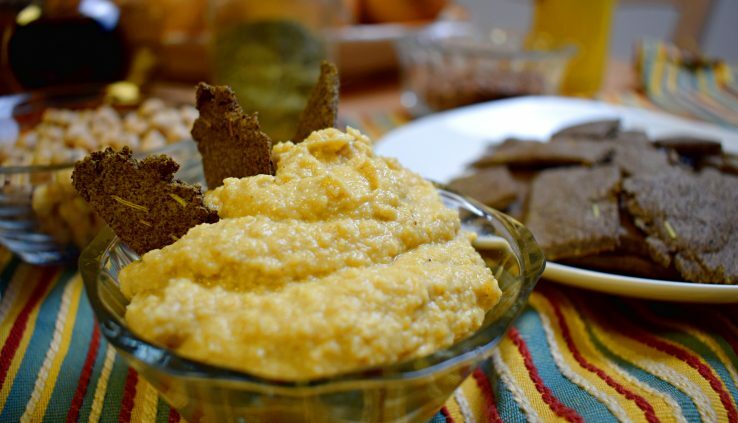 Recipes for hummus date back to the 13th century. The word itself means chickpeas in Arabic, and the ingredients were common to the middle east and Egypt for millennia. Our modern versions likely taste similar, but variations in the ingredients can make a difference. Even regional differences today can still make a difference. You can follow my recipe and end up with different flavours than I got. It’s why all recipes have a lot of “decide for yourself” implied steps. I’m using unhulled sesame seeds, as that’s only what’s in the local store. It likely contributes to a slightly rougher texture than hulled seeds. The extra virgin olive oil can be substituted with any other salad oil. You’ll change the taste, but you’ll still end up with an enjoyable hummus. I’m uncertain still how I can mark such allowances in the recipes. Giving a big list of all allowed oils would be silly. If you try this with a fancy oil, like avocado or walnut, I’d love to know how it tastes! I’m working on a recipe for low-carb crackers that go with this. They taste great, but I haven’t figured out the water content yet. It’s difficult to roll and requires 1-3 hours in a low-temperature oven. Enjoy the traditional Levantine dip. Put ingredients in a blender. Blend until smooth. You will need to use a spatula to push down the sides a couple of times. Put chickpeas in a bowl and fill with enough water to cover them. Let soak for 24 hours. Drain the water and rinse the chickpeas. Put chickpeas in a bot and fill with enough water to cover them. Bring to a boil, then lower heat. Let simmer for one hour. Remove from heat. Drain the water into a cup for later. Put chickpeas, oil, lemon juice, garlic, salt and chili in the blender. Add about 30ml of water drained from the cooked chickpeas. Blend until smooth. Add more water, a bit at a time, if it isn't fluid enough to blend. Blend until mixed. Add more water, a bit at a time, if too thick for your tastes.